We’ve been looking at lawn problems with commercial landscape folks this past week, and I thought I’d put a little piece about what we’re seeing. Brown patch (Rhizoctonia solani) is the most common disease I find, and most common disease the diagnostic lab in Athens sees as well. Down here, we see it in centipede, and also St. Augustine. Brown patch is generally a disease of spring and fall. However, temperatures from October through January have been ideal for this pathogen. Just after Christmas, I was asked to look at lots of centipede yards from homeowners where symptoms looked like brown patch. On the microscope, I never was able to confirm the pathogen. 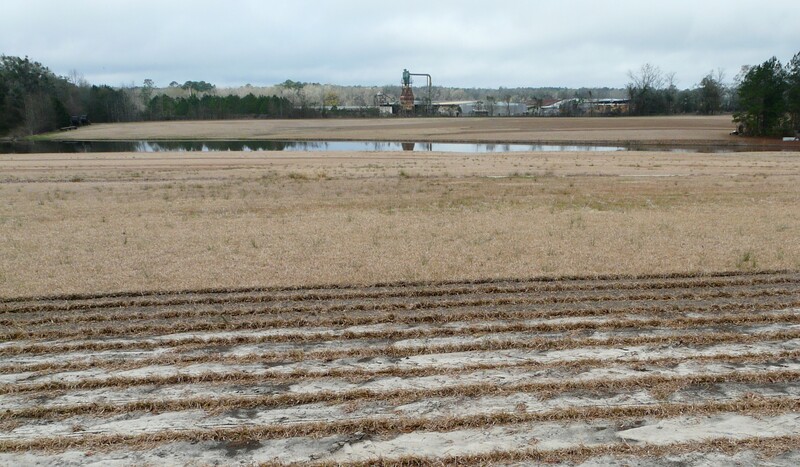 UGA Extension Pathologist Dr. Elizabeth Little confirmed that too much rain – environmental conditions – was to blame for these problems across the state. Once January freezes began, I had no more calls about lawn issues. Grass finally went dormant where lawns were open. We still have green turf under trees – mostly St. Augustine. Last week, we looked at some St. Augustine affected with brown patch. Much of it is not dormant. It had been treated three weeks ago. Before this, it was treated in November. This inquired lots of questions like is it active? Should we spray again now? Upon looking at the yard, the symptoms represented old disease. The disease infected during the warm period sometime between December and January. The recent cold weather is too cold for the pathogen to be active. There are some spots that appear to show some activity. Conditions that favor brown patch pathogen night temperature above 60 degrees and daytime temperature above 80 degrees. Our days have become warmer, though nights are still cool. A pathogen in infected grass could become active during these temperatures. However, does a small chance at pathogen activity warrant a spray? According to UGA Extension Turf Pathologist Dr. Alfredo Martinez, we need consistent days of 65 degree soil temperatures for the right conditions for Brown Patch to exist. Any fungicide sprays now will likely not be effective. Fungicide treatments in dormant turf? When turf is dormant, it is not recommended to apply fungicides. Strobilurins (Heritage) and DMI’s (propiconazole) are systemic in the plant. When turf is dormant, these fungicides – which are our heavy hitters for soil pathogens – are not effective. On the other hand, contact fungicides, like chlorothanonil, may be effective on a pathogen in dormant grass. However, with cold temperatures, the pathogen is less or completely inactive. Keep in mind that managing disease is more cultural than chemical. With brown patch, we need to limit our nitrogen when disease is active. We may also increase our potash. Fertilizers with K only can be used at the end of the season to increase vigor through winter. We also need to watch irrigation. The most common cultural issue I find is lawns watered 2 and 3 times a week. This makes disease almost certain. We need to irrigate between 9pm and 9am and apply enough to give the turf 1 inch of water per week, once per week. Deep, infrequent water events help increase rooting depth and lessen disease conditions. 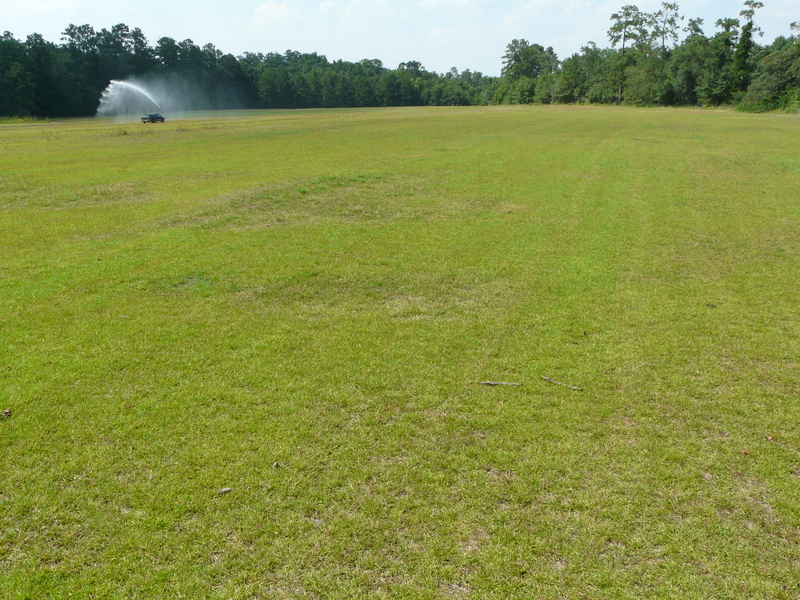 To see more on brown patch, visit Turf Diseases In Georgia: Identification & Control. At the beginning of this month, I started getting lots of turf calls about caterpillars. We are still seeing them rampant now. They are sod webworms and different species of armyworms. I have mostly seen sod webworms, which are less than an inch long and have dark spots over their body. They overwinter as caterpillars in protective webbing. In the spring, they feed and molt into the pupal stae. The adults emerge, fly and mate. They have two or three generations a year. It is recommended to treat in the young larval stage; however, its later instars that do damage to the turf. It’s easy to see the chewed grass blades. Sod webworms tend to survive better in higher-cut turf. This season, I’ve noticed them in St. Augustinegrass. I have seen them previously in centipedegrass. We have been discussing treatment and checking behind turf that has been sprayed. You won’t find the dead worms because the organic matter is very high, unlike row crops, where dead bodies are quickly broken down by microbes and fungus is thatch. UGA Extension Enotmologist Dr. Will Hudson says they have developed an adaptation where if they are sprayed in the latest larval instar, they will go ahead and pupate. In South Georgia, caterpillars can be in issue through the month of September. What about adult moths? We are still seeing a high amount of moths. It is not recommended to treat moths since most moths do not produce caterpillars that survive to a size that will do noticeable damage. Dr. Hudson says – as of now- it’s pretty late in the season for another generation to do much damage to a healthy lawn. Another pest I just saw this week is damage from chinch bugs. Chinch bugs infest during dry conditions. Our rain in Thomas County has been very spotty the last 3 weeks. We’ve been over a week in town without rain, and I saw this damage at our courthouse. There was no chewing on the grass blades, so I looked in the grass and found chinch bugs. Chinch bugs have the piercing/sucking mouthparts like stinkbugs and feed at the base of the grass blade. This damage shows up as discoloring of the leaves and stolons. They tend to associate with St. Augustinegrass. They feed in clusters and damage first appearch as circular patches of yellowing turf that resemble drought. They are very tiny – can fit inside your pinky finger nail. Pull back the grass and look through the thatch. If they are present, you will see the bugs crawling around. They are so small, it is difficult to catch them. “When it rains, it pours.” And it has brought lots of issues with our yards other than slime mold. Even growers are asking about these issues they are seeing. Why is the grass is turning yellow and dying in irregular shapes? In between our commercial ag calls, us county agents answer residential calls about landscape issues also. I’ve learned a lot about centipede and St. Augustinegrass in 3 1/2 years, but some of the things I’m seeing for the first time this week. Rain and humidity provide the environment for disease. Usually, Large Patch (Rhizoctonia solani) will show up in centipedegrass during this time. 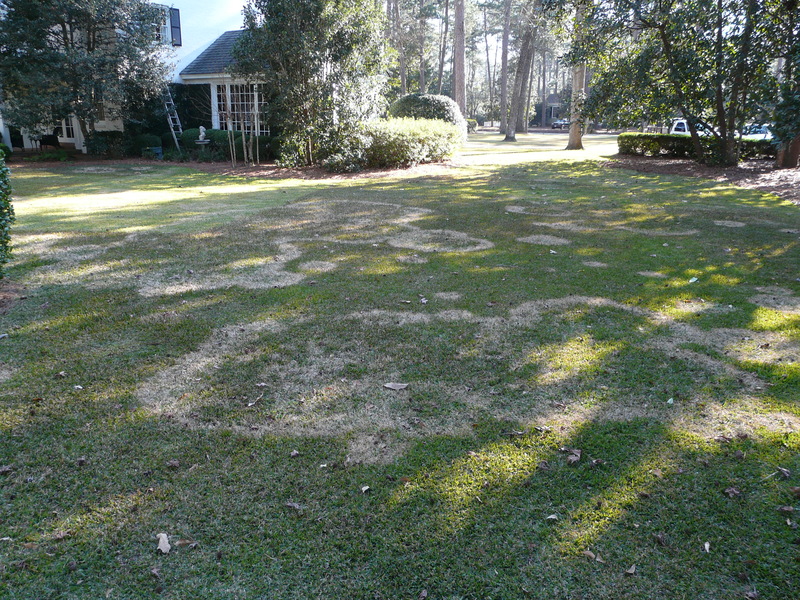 You will see brown spots in the lawn with a nearly perfect expanding circle. St. Augustine generally gets Take-All Patch (Gaeumannomyces graminis) with significant damage. 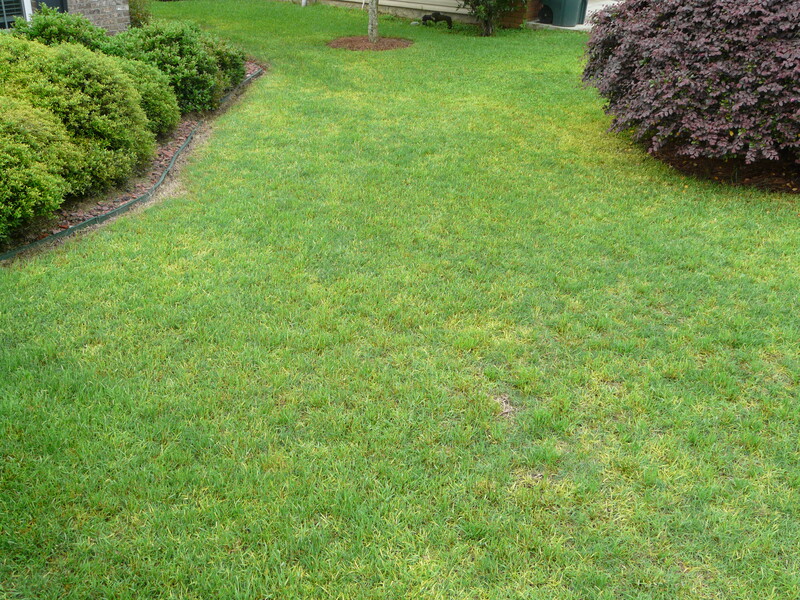 Another common issue during periods of rain is yellowing of the grass blades. This is result of nitrogen and potassium leaching out with rain (below). ……however, we always look under the compound scope to confirm it. In this case, the “hyphopodia” turned out to be clumps of mycelia. 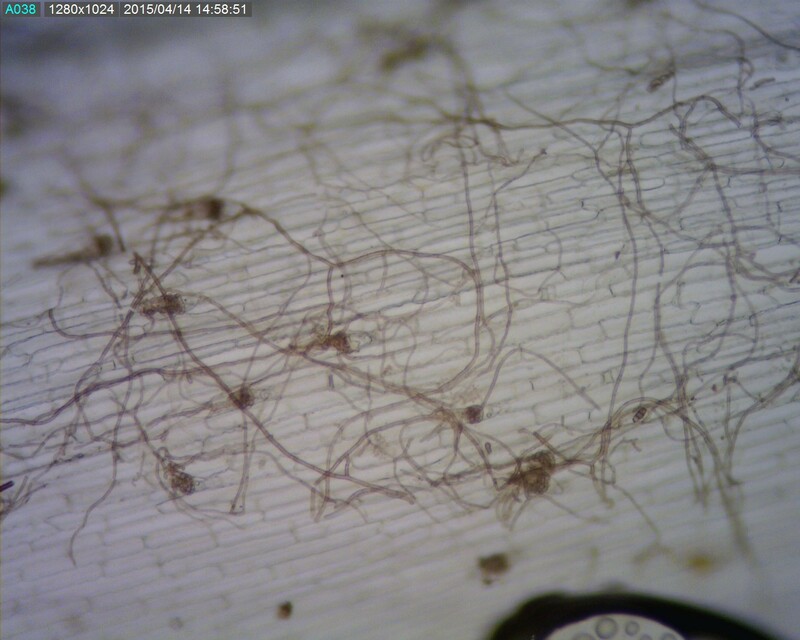 The issue was that these mycelia did not have all the key ID features of Rhizoctonia (Brown color, crosswalls, 90 degree branch angle, and taper at the branch). I showed this to our diagnostician who sees lots of Rhizocontia and she was not convinced this is Rhizoctonia. She thought it was too erratic. However, the runner hyphae of rhizoctonia will make infection cushions of balled up hyphae where they enter the plant. That is what these look like to me. So this could be a random saprophytic fungus or possibly Rhizoctonia but you would need to look some more to confirm. 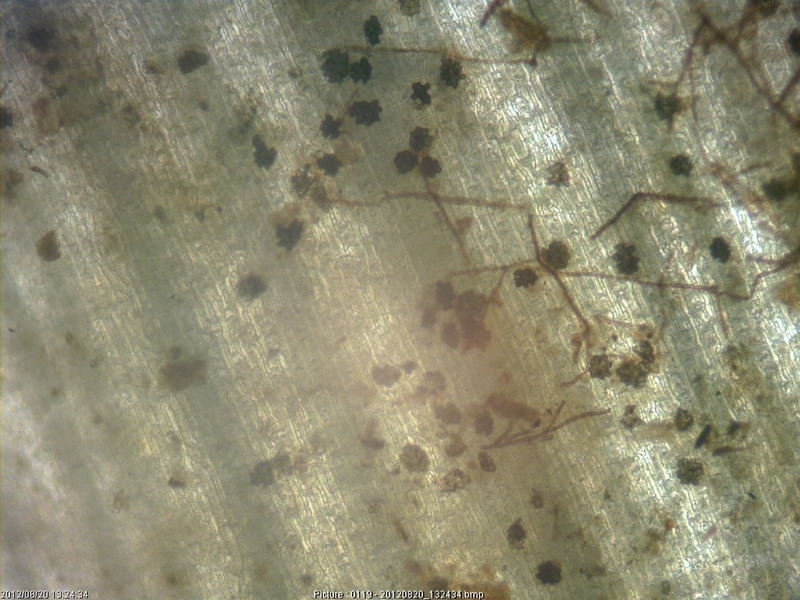 When conditions are wet like this Rhizoctonia and other fungi are everywhere. I am getting many centipede samples of poor greenup but I am thinking any Rhizoctonia is probably secondary to the environmental stress, especially if there is no distinct pattern of large patch. I’ve had two few calls today about a purple color, powdery substance showing up in circles in the yard. Someone also brought in a few weeds with the same purple dots on the leaf. These recent rains have created the environment for slime molds to appear. It causes no problems other than being unsightly. Slime molds belong to the Myxomycete fungi class that obtain their nutrients from dead, organic matter. They can also be seen in the flower beds and gardens where they may appear as the ‘blob’ or plasmodium. They don’t cause any direct injury to the plants, but can inhibit photosynthesis. Control does not require any chemicals. You can mow the lawn or wash off with a water hose to remove it. 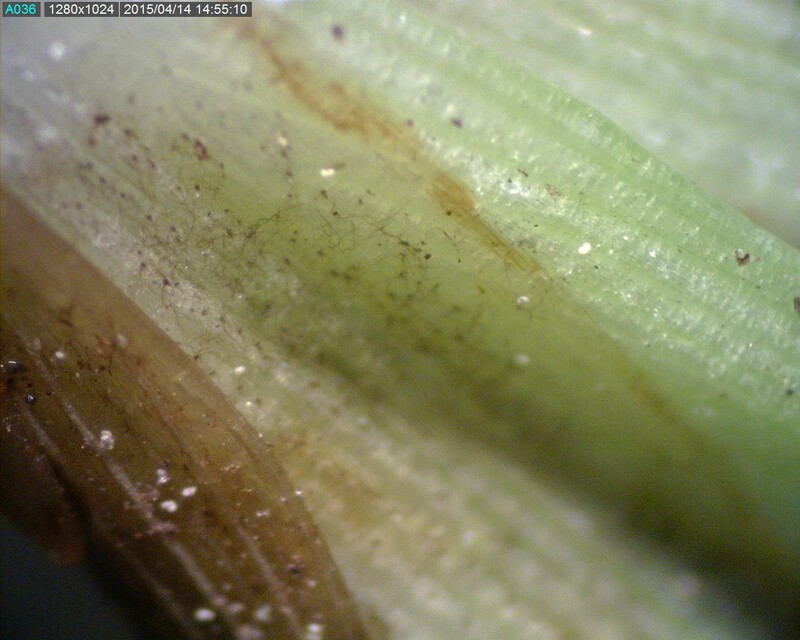 Here are some pictures of slime mold I have taken in centipedegrass. Here is a UGA publication on The Truth About Slime Molds, Spanish Moss, Lichens, and Mistletoe for more information. This is from a few weeks ago. Our turf and pastures are really starting to green up now. 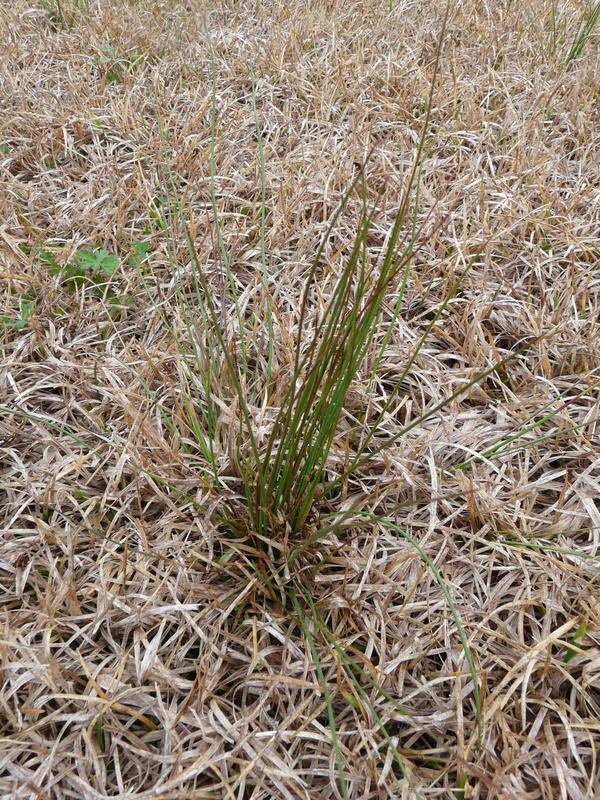 Here is a clumping, grass-like weed that sometimes pops up in our lawns this time of year. We looked at this on a sod farm south of Thomasville. It looks a lot like wild onion, but doesn’t smell at all like onion. The stems are round and hollow. It grows more in fields that are more wet. It turns out to be a rush. 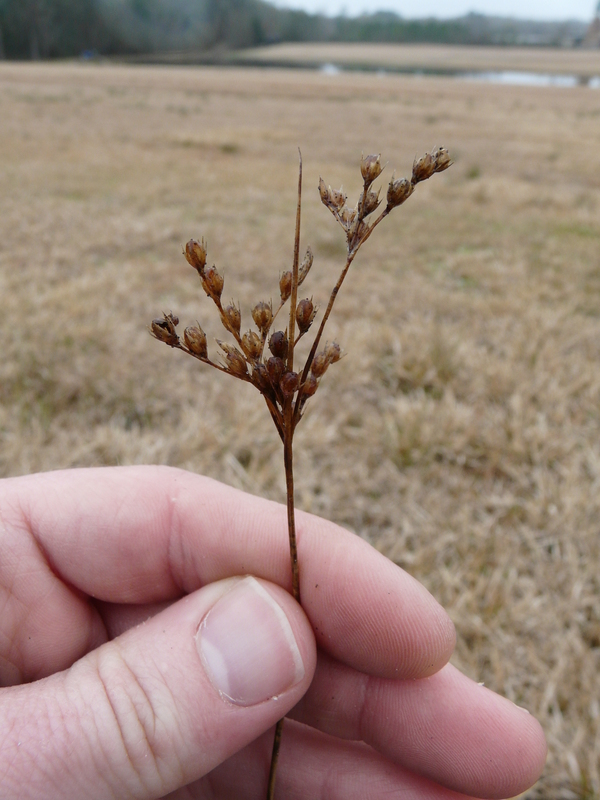 UGA Extension Weed Scientist Dr. Patrick McCullough believes it is slender rush (Juncus tenuis). It generally doesn’t cause any trouble, and it dies out in the summer. If it needs to be treated, Dr. McCullough says the mixture products which contain 2,4-D control rush species fairly well. This would be something like Trimec or Triplet. Cultural control is really our best method – mowing, or pulling it. Below is a picture of the roots and seedhead. We were able to find a seedhead from a plant last season. The seedhead has separated flowers. 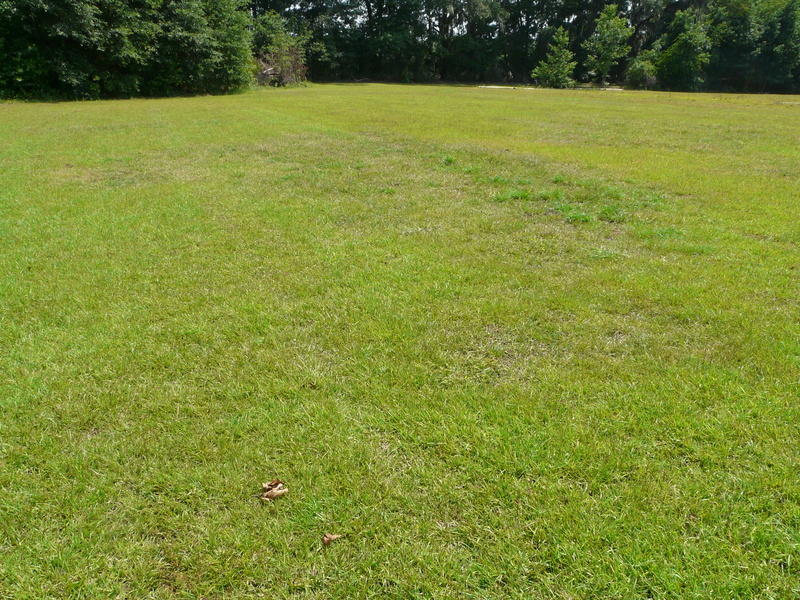 In between checking fields, I look at many lawn related issues in Thomasville. Shortly after our drought spell, we were seeing cetipedegrass die out in some areas. This was the result of heat and drought. Soon after this, I was asked to look at some St. Augustinegrass that appeared to have the same problem. Lawn symptoms looked similar to drought stress, but we looked down in the thatch and confirmed chinch bugs. They are very small and hard to catch. You have to look toward the boarders of the infected area, and then look down in the thatch. 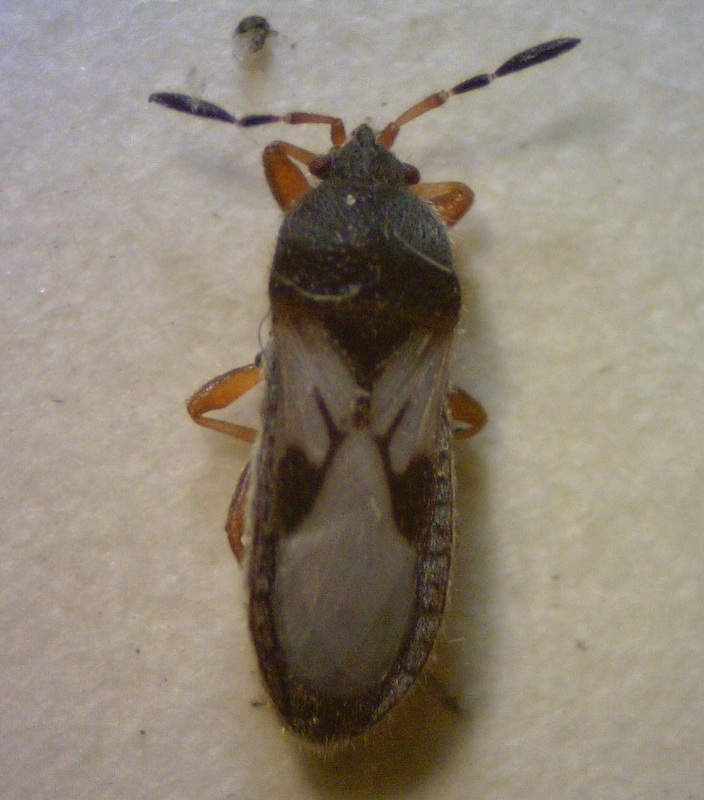 Chinch bugs are in the Hemiptera or “true bug” insect order which means they have piercing/sucking mouthparts. They cause damage by feeding on the lower blades of the grass. They affect St. Augustine primarily but can also infect all other warm season grasses. Their damage is first noticed during hot, dry periods in sunny areas of the lawn. This is why they thought this was likely result of drought. 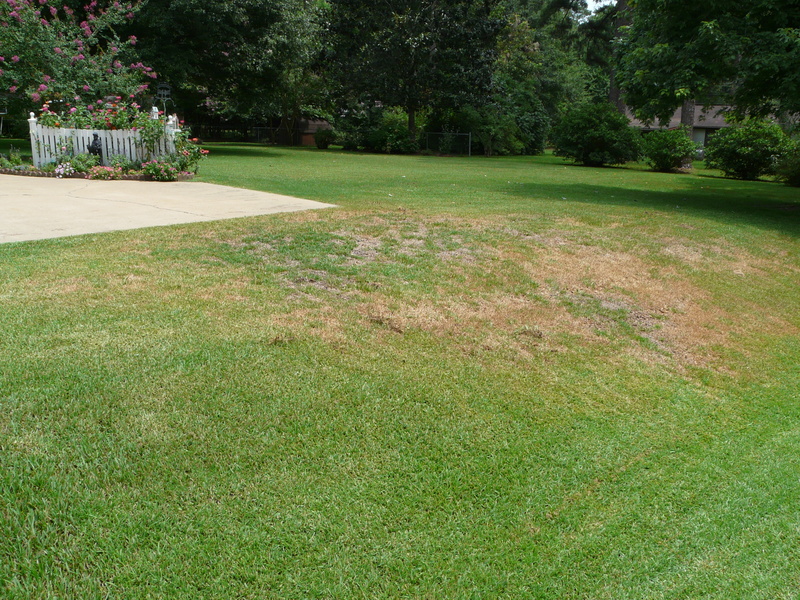 In the case of chinch bugs, dry spells are an indirect cause. UGA Extension Pathologist, Dr. Alfredo Martinez, said centipedegrass can easily be colonized by nematodes compared to other species. 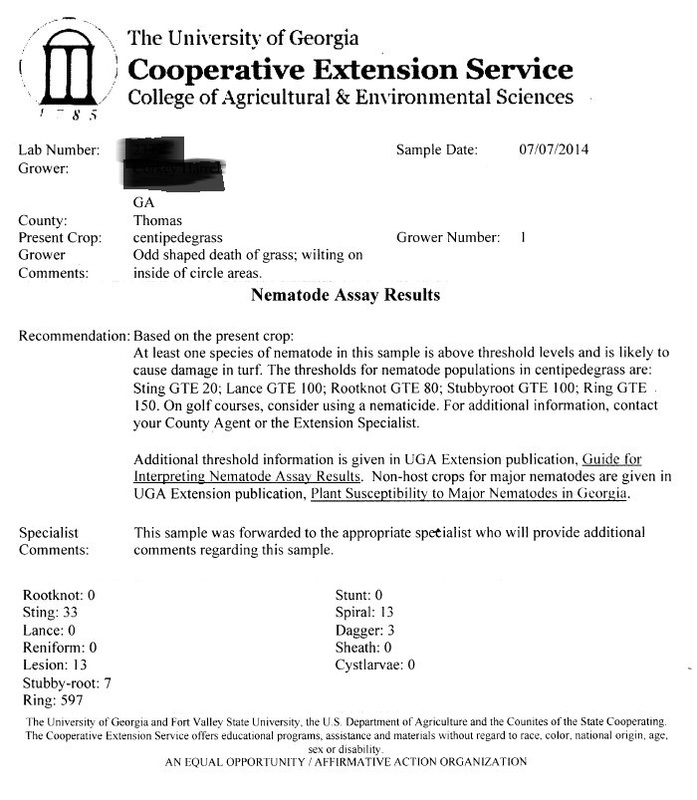 The report showed both Ring and Sting nematodes being above thresholds. UGA Extension Turf Agronomist Dr. Clint Waltz says at this stage it would be best to increase irrigation and fertility. 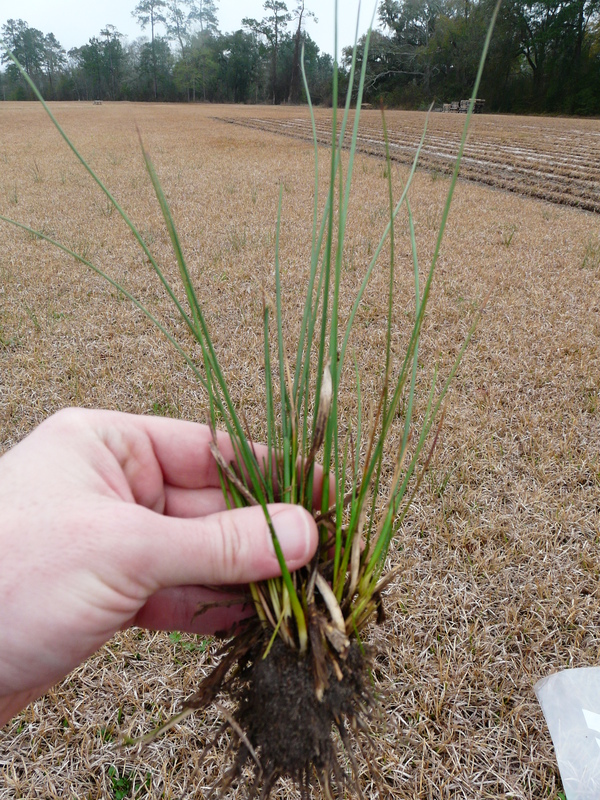 When ready, harvest this grass then consider a nematode treatment prior to reestablishment. Also, the soil test showed pH to be 4.9. Centipedegrass can take a lower pH than bermudagrass, but below 5.5 is pushing it. Research shows a pH of closer to 6.0 is better for centipede establishment. The liming will raise the pH and take effect next year. This will help increase overall fertility. Dr. Martinez also suggested using an all purpose systemic fungicides (fungicides containing thiophanate methyl, propiconazole or an strobilurin). This might help to control any facultative pathogen/saprophyte that might be lingering.